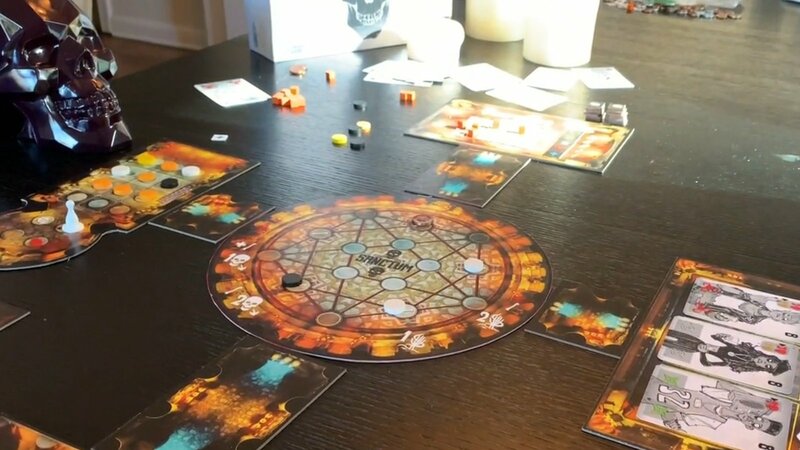 Pandasaurus Games, the makers of Dinosaur Island, The Mind, and Machi Koro, have released a new Kickstarter campaign for Dead Man’s Cabal. Already shattering its Kickstarter goal of $15,000, the macabre strategy game aims to help budding necromancers throw a killer party. Dead Man’s Cabal is a new strategy game from Pandasaurus Games (Dinosaur Island, Machi Koro, The Mind) from designer Daniel Newman with game development from Jonathan Gilmour (Dead of Winter, Dinosaur Island, Wasteland Express Delivery Service). Dead Man’s is a mid-weight strategy game that plays in 60-90 minutes for 2-4 players. Already an elegant and smooth design, Jonathan has guided the game through 18 months of blind-playtests with hundreds of different game groups to make sure it was exquisitely streamlined and balanced. And now we need your help to make the game as good as it can be! With a very quick delivery time (estimated delivery June 2019), and a lot of original art and 3d rendered components, at this price the game should be a no-brainer for tabletop enthusiasts. For those that want to get a copy of Dead Man’s Cabal, there is a tier that allows one to get the game and any unlocked stretch goals for $50. The Kickstarter for Dead Man’s Cabal is live until February 15th, and can be found here. Stay tuned for more tabletop news here on Gaming Trend.